Soothing music from Wesley Dawnbreakers. 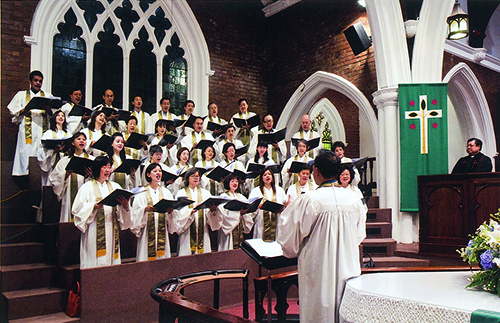 MOST of the people who came for the Aldersgate Convention 2008, held at Wesley Methodist Church from May 19 to 24, found it “worth attending”. Not everyone, however, agreed totally with what the two speakers had presented, but most of the attendees said they “have learned something interesting from the speaker’s interpretations”. 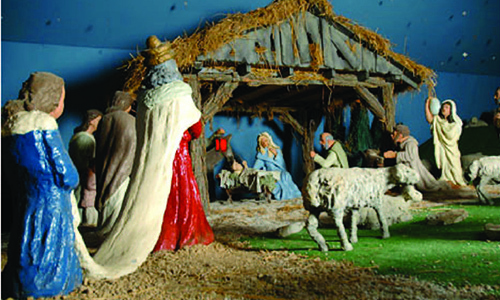 They were referring to the evening talks and seminars conducted by the Rev Dr Ben Witherington, III, the convention’s keynote speaker, who is Professor of New Testament Interpretation at Asbury Theological Seminary in Kentucky, the United States. 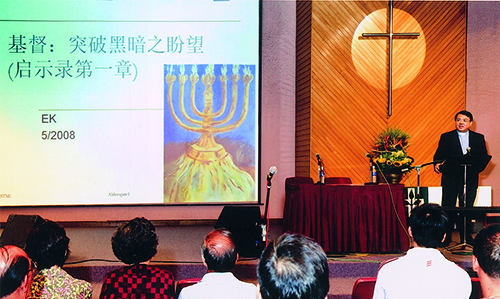 While the Rev Dr Witherington’s three evening talks attracted an average of 400 people and his public seminar drew about 110 people, two talks in Mandarin garnered 142 people on the first evening, May 19, and 128 the following evening. 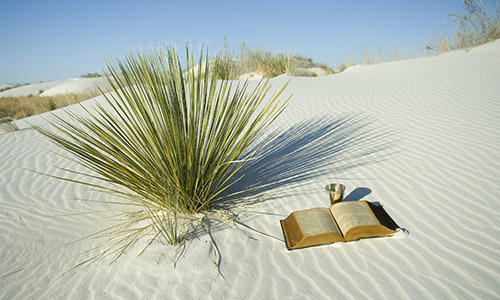 The Mandarin speaker was the Rev Dr Ezra Kok, Principal of Seminari Theoloji Malaysia. About 500 attended the Aldersgate Service on May 24, fewer than the number of attendees in past years. The three Trinity Annual Conference pastors who their 25- received their 25-year Long Service Award from Bishop Dr Robert Solomon at the Aldersgate Service on May 24 . 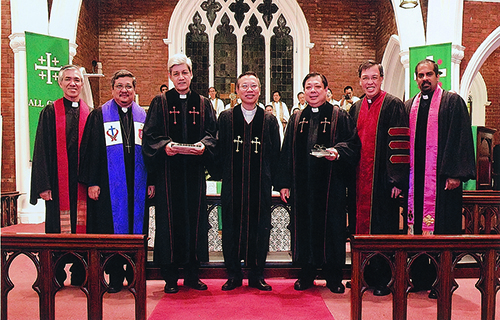 The three are the Rev Edmund de Souza (third from left), the Rev Lee Yam Kai (fourth from left), and the Rev Melvin Huang (fi fth from left). 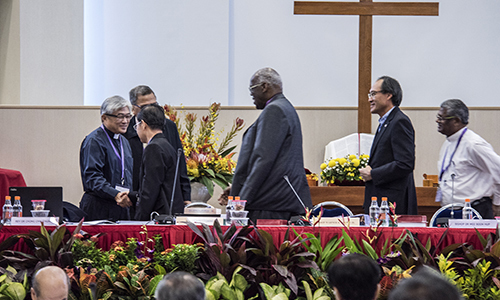 Others in the picture are, from left, Chinese Annual Conference President Rev Khoo Cheng Hoot, Bishop Dr Solomon, Trinity Annual Conference President Rev Dr Wee Boon Hup and Emmanuel Tamil Annual Conference President Rev James Nagulan. 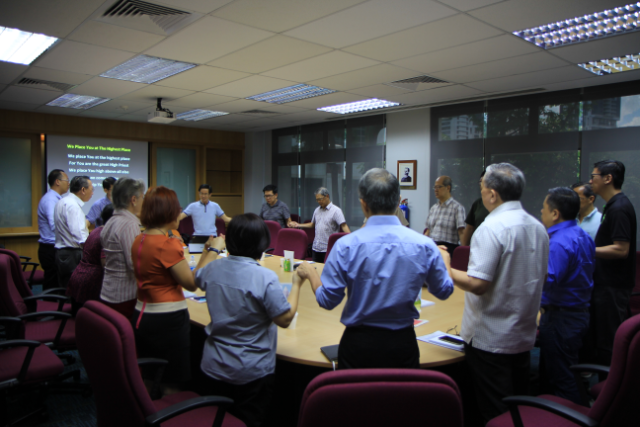 The Rev Dr Kok addressing seminar participants on May 19. 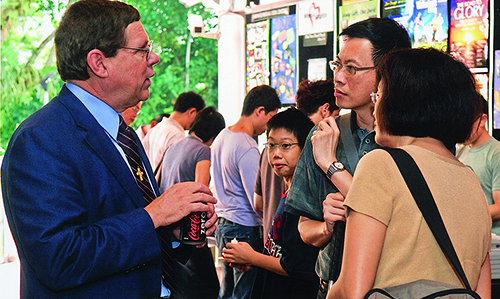 The Rev Dr Witherington interacting with church members at the book stall during tea break.